I use iTunes and have burned all my CDs to iTunes. I also have a huge box in my basement of all the hardcopy CDs. Is there any reason I would need to keep them (computer crash or something), or am I safe to start giving them away? Christy, the idealist in me says that if you have burned all of your CDs in a lossless format and you have your computer backed up to a secure online location, you should be fine getting rid of your physical CDs. However, the pragmatist in me has to admit that there is a box of CDs in my basement and I wouldn’t even do what I just suggested. Also, from a legal standpoint, you aren’t supposed to have a digital copy of a CD without also having the physical copy. I guess when it comes down to it, my official advice would be to simply get rid of the jewel cases (they can be recycled in most communities) and store all of your hardcopy CDs in a CD Notebook. If you do this, you won’t have to pay the fees to store all of your lossless music data online and you’ll cover your arse if the RIAA ever comes knocking at your door. Thank you, Christy, for submitting your question for our Ask Unclutterer column. I am a fan of this space for a number of reasons. First, I like the use of the Metro Shelving units that allow |Andrea| to configure the space in a multitude of ways. 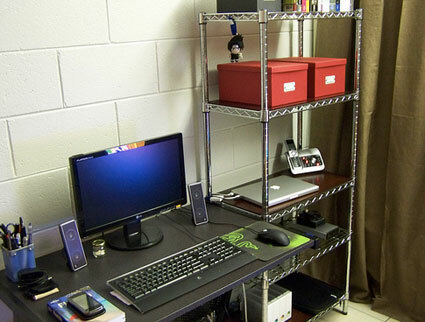 Second, I like how things are grouped together by purpose: books on one shelf, media on another (DVDs and such are stored in the red boxes), only things used while working are on the desktop, etc. Finally, I like how the cables have been managed so that they’re not overwhelming the work surface. Well done. Thank you, |Andrea|, for your submission to our pool. Excerpt: How many bath linens do you need? Below is the final excerpt from my book Unclutter Your Life in One Week we plan to run on the site — this time on how to determine how many towels and washcloths you need in your linen closet. “During its second season in 1967, the television show Star Trek aired an episode called ‘The Trouble with Tribbles.’ In this episode, a member of the crew of the Starship Enterprise is given a cuddly, furry tribble as a pet. Unfortunately for the crew, the tribble reproduces at an alarming rate and thousands of tribbles end up eating all of the grain on the ship. The crew runs the risk of dying of starvation out in deep space since their food supply has been so greatly depleted. I won’t give away details about the ending of the episode, but since the show went on to run for another season and a half, you can probably guess that they found a way out of the furry situation. I mention this episode of Star Trek because I remember thinking about it the first time I cleared the clutter from my linen storage. I was convinced that my bath towels and washcloths had multiplied. I remembered buying one of the towels before I started college, but I had no memory of how I acquired the dozens more in the years since. It was as if they had spontaneously reproduced while the doors to the linen closet were shut. The logic behind the equation is that you have one bath towel and washcloth in use and another set in the linen closet ready to go. Since houseguests only need towels while they’re staying with you, they don’t need extras in reserve. Most guest rooms can accommodate two people, so multiplying the number of guest rooms by two usually provides for a towel per guest. (I’m using the term guest room in a general sense; in our house the guest room is an apple-green pullout couch in the middle of the living room.) If you have four people living in your home and zero guest rooms, then you should have eight bath towels and eight washcloths: (4 + 0) x 2 = 8. If you have three people living in your home and two guest rooms, then you should have ten towels and ten washcloths: (3 + 2) x 2 = 10. This equation might not work for everyone, but most people find it to be a good starting point. If you’re a whiz at laundry, you might be able to get by on one set of towels per person. If you’re particular about having a new washcloth every day, you might need more washcloths in your collection. If your towels are falling on your head every time you open your linen closet, it’s time to trim your collection. Below is another excerpt from my book Unclutter Your Life in One Week — this time on how to have a social life in this busy world. “One of my biggest complaints about adulthood is that it’s difficult to simply hang out with friends. In high school, you could call up your friend and say, ‘Hey! A bunch of us are hanging out at Kara’s place. Stop by if you want to hang out.’ No one scheduled ‘hanging out’ on their calendar. No one knew at the start of the night what might transpire by the end of the night. And no one ever left at eight thirty, tapping at her watch, saying she had an early day tomorrow. When I graduated college, I was completely unprepared for having to schedule time to hang out with friends. The first time one of my friends told me that she had to check her calendar to see when we might be able to grab lunch together, I laughed so hard I made myself cry. Oh, to have so few responsibilities that we could hang out whenever we want! Review your list from the Foundations chapter that identifies the things that matter to you most. Is spending quality time with friends and family on your list? What else is on your list? Schedule the time now to live the remarkable life you desire. Don’t turn your back on your routines. A little time every day spent on basic routines will provide you with more time in your schedule to pursue the things that truly matter. Plan at least one social event a week. Make a date with your friends or loved ones and keep that obligation. If the people in your life are really a priority, then you need to respect the time you spend with them. Say no to less important requests for your time and keep your date. Plan at least one stay-home event a week. If you’re already a social butterfly, make a commitment to staying home at least one evening a week and taking care of yourself. Pay money to take a class. When you spend money on a class, you’re more likely to make a commitment to attending it. If you want to have more variation in your meal plan, take a cooking class at your local cooking school to give you ideas and confidence. If you have always dreamed of going to Rome, sign up for Italian language classes at the local community college to get you prepared. If you wish that you and your significant other would go out dancing, take a ballroom dance class together. If finances are tight, look for free classes listed in your newspaper and make the extra effort to attend. Many readers have emailed us today to complain about the content of some political banner ads running on this site over the last few days. Most of the banner ads and all of the RSS ads for this site are served by Google Adsense without any direct overview by us. We found many of these ads to be offensive enough that we have set our Adsense preferences to now block all political ads from running on this site. We haven’t made a permanent decision, but, at the very least, we are doing this until the end of this election season in the United States. I would also like to take this opportunity to remind those of you with a service or product that might be of interest to our readership that we sell banner ads on our site directly at a significant savings over the cost of purchasing them through Adsense. Does the oval offend some people? 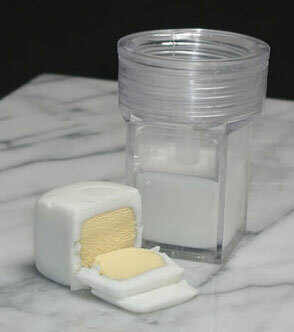 Do square eggs have a longer shelf life? Is it easier to crack a square egg than it is to crack an oval one? Is there a major problem with eggs rolling off counters and trays that I don’t yet know about? why? Why? WHY would anyone want a square egg?! Also, I think you have to own chickens or at least have access to immediately laid eggs to be able to take advantage of this device. Egg shells are only transformable for a very short time period after being laid. It seems like quite the task to be able to even get these to work. Please leave your explanations (the more humorous the better) for why someone might need the Egg Cuber in the comments. There must be some reason for such a device beyond the end result just looking cool. We all make exceptions to the uncluttered standards we have in place. In my closet are one or two pieces of clothing that don’t fit me right, but for some reason I haven’t been able to give them away to charity. There is a chipped mug in my kitchen cupboards that we got as a wedding gift and the sentimentality of the object pulls at my heartstrings. Also, there is an enormous Jumperoo in my office that makes me wince every time I walk past it, but all the jump, jump, jumping makes my son so blissfully happy that it stays. Making exceptions to uncluttered standards, though, can become a slippery slope. If we don’t keep a watchful eye on our stuff, eventually our entire homes and offices are filled with clutter again. This is especially true in places where clutter can easily hide — closets, cupboards, and toy bins. If getting rid of the object causes more distraction than having the object, I keep it. If I got rid of the chipped mug in my cupboard, I probably wouldn’t think twice about it once it was gone. So, the mug should go. 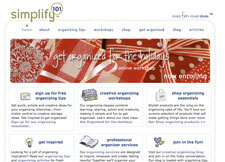 Do you make exceptions to your uncluttered standards? If so, how do you keep these exceptions from cluttering up your space? When purging papers from your home or office, let me recommend that you keep a list in a file in your filing cabinet or on your computer of all your previous addresses and addresses of your former places of employment. How much of your mortgage is going toward clutter storage? If there is a room in your home that is off limits because of the clutter that takes up that space, then you are not only wasting space but wasting money. This hack fits an incredible about of toys within and is easy to do. Projects you can tackle in under 15 minutes to keep you on track with your uncluttering efforts. Mismatched and creative items in your home are great as long as they are used, honored, and organized. 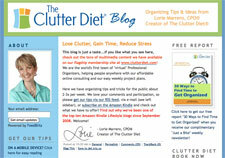 Unclutterer reader Skellie offers tips to make your blog clutter free. Below is another excerpt from my book Unclutter Your Life in One Week — this time on how to efficiently participate in a meeting. “You might not realize it, but meeting attendees have some control over how quickly a meeting runs and they certainly impact the quality of the discussion. Be prepared. Read the agenda at least a day in advance of the meeting. Come to the meeting with relevant materials. Have a pen and pad of paper with you. Turn your BlackBerry to vibrate. Know who else will be at the meeting. Know the goal of the meeting, its location, and its start time. Arrive at the meeting on time. Respect others. How many times have you been in a meeting where a presenter has had to repeat information because Gary and Stephanie were focusing on their laptops instead of paying attention the first time something was said? Not only does this type of distraction waste Gary’s and Stephanie’s time, but it also wastes the time of everyone attending the meeting. Focus your attention on who is speaking. Make eye contact. Show that you’re listening. Avoid making snide comments to your neighbor. If you’re having trouble concentrating, write down in excruciating detail everything the speaker is saying. It will give you something to do, and you can review your detailed notes later if you spaced out on what was being said. What do you do during meetings to help speed them along? Add your ideas to the comments. 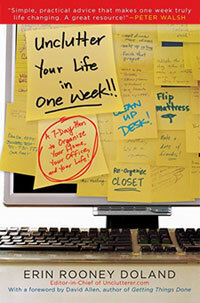 The following is an excerpt from my book Unclutter Your Life in One Week, which comes out next week on November 3. If you have pre-ordered the book, THANK YOU! and also don’t forget to sign up to receive the special PDF bonus worksheets. And, to let you know, the electronic Kindle version is now available for pre-order (still no word on the other e-book formats). Similar to what you might do when exercising, play music with a fast rhythm. If you drink caffeine, consume it in small, frequent amounts instead of just one large cup at the beginning of the day. Set time-specific goals in two-, five-, or ten-minute increments. Identify what you want to accomplish in a very short amount of time, and then set a timer and go for it. Isolate yourself. Remove the desire to procrastinate by not having any other options but to work. Acknowledge that you’re procrastinating. Often, just realizing that you’re putting something off is enough to get you working. Challenge a colleague to see who can get the most work done in a set time period. Ask someone to help you stay accountable. There are professional motivators who will call you once a day to see how you’re doing, but a trusted and willing friend or coworker can do the same thing for free. Since our son surprisingly joined our family two months ago, my husband and I have had weird eating routines. Gone were the days of sitting down and eating a well-balanced meal at the table, and in were sandwiches gobbled over the sink in a groggy, sleep-deprived daze. I don’t like hastily prepared meals that lack major nutritional food groups, so I called my mom and asked her to help me get things back on track. This past weekend, my mom and I prepared, cooked, and froze about a month’s worth of meals. Beef stew, burritos, pre-mixed ingredients for homemade bread, and dozens of other options now line the shelves of our refrigerator and freezer. It’s nice to once again be working from a meal plan and not feel overwhelmed by the simple act of getting dinner on the table. I’ve found that extending a formal invitation to a friend or family member to help with an aspect of my life where I need to be better organized can be the motivation I need to get things done. I actually did most of the cooking this weekend while my mom played with her grandson and kept me company. Simply having a set time on the schedule and someone with me meant that I didn’t put off this chore and stayed focused on it. In addition to meal preparations, this idea also works great for closet uncluttering, paper filing, and cleaning out the garage. Also, last week, the Lifehacker blog ran a wonderful article called “10 Simple Freezer Tricks to Save You Time and Money” that can get you moving in the same direction. How do you keep from feeling overwhelmed at mealtime? Give us your tips in the comments. Each year, the Los Angeles Organizing Awards literally roll out the red carpet to honor individuals and companies in the professional organizing world. For the first time, Unclutterer.com has been nominated for one of these prestigious awards in the “Best Organizing Website or Blog” category. Now through December 15 you can cast your vote for your favorite products, services, and organizers in the many categories. Anyone can vote — you don’t need to be a professional organizer — and those of us at Unclutterer would love your support if you think that we’re worthy in the Website category. The winners will be announced in late January at the historic Raleigh Studios in Hollywood. The Los Angeles Organizing Awards are the organizing world’s equivalent of the Oscars or Emmys, and we’re truly honored to be nominated for a 2010 award. I recommend checking out the nominations in all of the categories, even if you don’t vote for us or vote for any of the options. It’s nice to see a listing of the best of the best in the industry. I learned about the Canadian organizing television show Neat through last year’s voting process and many other great organizing and uncluttering resources that had never made it onto my radar screen. Again, now through December 15 you can cast your vote for your favorite products, services, and organizers in the many categories, and obviously we would truly appreciate your support if you think we’re worthy in the “Best Organizing Website or Blog” category.